Rockefeller Center is one of the top destinations during the Christmas season. Bring your holiday spirit and enjoy the lights and decorations, see the famous Rockettes Christmas Spectacular, do some shopping, take a spin on ice at the Ice Rink, visit Santa and have a memorable meal. When you need a break, stop at Starbucks for a Peppermint Mocha or Christmas Blend coffee. 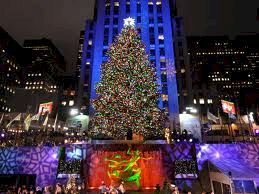 There is so much to see and do in New York during the holiday season, and Rockefeller Center is at the center of it all. Listed below are the most popular Rockefeller Center holiday traditions. See the Related Links below the listings for access to maps and more information. Don't miss the excellent Rockefeller Center Map. The Rockefeller Center Christmas Tree is the city’s seasonal centerpiece. Each year, a tree is selected (typically a Norway spruce), erected on the Plaza at 30 Rock and decorated with 30,000 LED lights. On a date in late November, crowds gather to witness the first illumination of the season, while many more watch from their homes on TV. There are live performances from top stars, as well as taped segments, to celebrate the beginning of the holiday season. The tree is lit each night through early January. TIP: Plan to get there early to claim your space on the Plaza. People will start arriving early afternoon. Another annual holiday tradition in New York is ice skating at the Rockefeller Center Ice Rink. Beginning in mid-October and continuing through April, novices and experts alike hit the ice for a bit of winter fun. A 90-minute session runs about $20-25 for adults and $12-15 for kids and seniors (higher rates are for peak season); skate rentals are $10. You can even take a lesson (call 212-332-7655 to schedule) or host a private event for 15 or more people (212-332-7614). If your preference is to watch the ice skating rather than participate, you can get a great view from the Rock Center Café. TIP: You may be surprised that the Ice Rink is relatively small, just 122-feet by 59-feet. During peak season, you may have to wait in line a bit. If you’re visiting Rockefeller Center with children, you may want to consider making a reservation to have Breakfast with Santa. You will enjoy a breakfast buffet with a visit from Santa and a holiday gift for the kids. You can choose between two restaurants. At the Rock Center Café, you’ll be treated to French toast, scrambled eggs, bacon, sausage, potato hash, assorted breads, seasonal fruit, gingerbread people and more. Prices for Rock Center Café are $65 for adults and $55 for children. Your second choice is The Sea Grill, which has a bit more extensive menu, adding a crepe station, omelet station and chocolate fountain with fruit. Prices for The Sea Grill are $75 for adults and $65 for children. Note that the Breakfast with Santa includes a pass for a session on the Rockefeller Center Ice Rink, which may be used any date during the skating season. TIP: Make your reservation NOW! Reservation availability is already limited! Another holiday tradition, dating back to 1933, is the Radio City Christmas Spectacular, featuring the Rockettes and many other talented performers, stunning costumes, exhilarating music and even Santa. This 90-minute performance astonishes audiences with elaborate production sets and special effects. Radio City Music Hall itself becomes even more striking with its holiday decorations. This show will be enjoyed by the entire family. TIP: If you are unable to see the Radio City Christmas Spectacular while visiting New York, the National Tour will be visiting Nashville, St. Louis, Dallas/Ft. Worth and Chicago. Of course you’ll want to do some holiday shopping while visiting Rockefeller Center. The Center boasts over 100 stores for apparel, gifts, books, art, and more. Top names include Banana Republic, Anthropologie, Ann Taylor, Brookstone, Kenneth Cole and J. Crew. At the Metropolitan Museum of Art Store, you’ll find holiday cards, ornaments, Advent calendars, tree toppers and more. Rockefeller Center also offers a number of restaurant choices, from fine dining to fast food. Steaks, seafood, French cuisine and sushi are just a few of your higher end choices. For a quick bite, there’s Au Bon Pain, Chipotle, Just Salads and so much more. Chocolate shops, a bakery, gourmet food stores and food & wine gift shops round out the food options. All the gamers in the family will enjoy Nintendo World, where they have 10,000 square feet of interactive play with new Nintendo and Wii games. There is also a Nintendo shop. The Lego Store offers both playtime and shopping for that special holiday gift. At FDNY Fire Zone, families can learn about fire safety, meet a firefighter and climb aboard a fire truck, and explore a variety of hands-on exhibits. You can purchase FDNY apparel and gifts as well. You and your family may want to take a Rockefeller Center Tour to experience its history and artistry with the guidance of an expert historian. To get a panoramic view of Rockefeller Center and beyond, check out the Top of the Rock Observation Deck on the 67th, 69th and 70th floors of 30 Rock. Access a Printable copy of this article. View a Map of Rockefeller Center. Check our Guide to Rockefeller Center. Check out our selection of Hotels near Rockefeller Center. Visit the Official Web Site of Rockefeller Center. See our New York Shopping section.